Our Bunkhouse offers 2 rental options (West Wing and East Wing). It's ideal for larger groups up to 17 people! The West Wing of the Bunkhouse accommodates up to 11 persons and has large bathroom with hot shower, fully equipped kitchen with full size refrigerator, dining room, living room, and Dish television. If you have a larger group up to 17 people, rent them both! In fact, our Black Diamond Guest Ranch can host up to 200 people, 49 in beds and soft sided tents, the remainder in bring-your-own tent sites and RV spaces. Guests who stay at at the Bunkhouse have access to our main Lodge (which has a wheelchair ramp) and a commercial kitchen for rent to accommodate large parties, i.e. weddings, fundraisers, family reunions, anniversaries, scouting events, church events, etc. 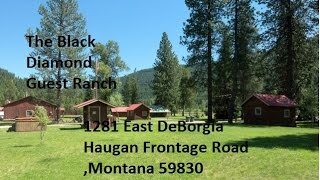 Welcome to the historic district of DeBorgia/Haugan where your next door neighbor is the Lolo National Forest. Gather around the bonfire and listen to an educational USFS Ranger talk about our pristine nature and exciting wildlife. Boarding your horse!? Outside corrals and inside barn horse stalls available. Since you book directly with us, we can tell you about the area so you have the best possible visit. Let us custom design your visit to suit your needs for self-guided hunts and angler/fishing adventures you’ll remember forever. There are lots of lodging options at the ranch too: bring-your-own-tent camping plus RV parking. 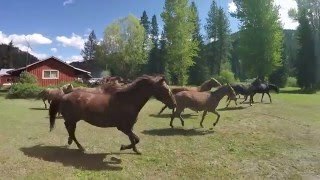 If hunting and fishing bring you to DeBorgia, we are a licensed Outfitter for hunters and anglers and offer drop camp experiences via pack mules and horses.. Prefer something faster? We recommend scenic river rafting on the Clark Fork River. The famous Hiawatha Trail is great for biking. Plan ahead and let us design a customized adventure to suit your group. Ski packages at nearby Lookout Ski Lodge are popular with winter guests. Be sure to bring your skates and enjoy some ice time on one of our ponds. All prices: Plus 7% lodging tax and 3% credit card fee. Holidays are two night minimum. Required deposits and credit card information required to confirm reservation. For cabin reservations, $25.00 non-refundable deposit is required. 24-hour written cancellation notice required acknowledged by BDGR. For all reservations in excess of $1,000.00, a 50% deposit is required AND a 15-day written cancellation notice is required and acknowledgement by BDGR is required; otherwise, any deposit on file is forfeited.